One of the reasons I love living in Palo Alto is that we're living in a place that values innovation and change. Traffic lights and potholes and internet access (hello, city council, when are we getting city-wide free wifi?) notwithstanding, Palo Alto and Silicon Valley is always on the cutting edge. And we're not just talking hi-tech: check out Palo Alto's newest playground, the Magical Bridge Playground. 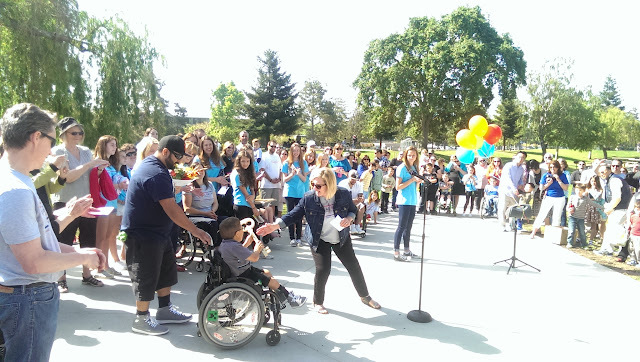 It's the only playground in the Bay Area designed to accommodate kids of all abilities, and one of the few playgrounds in the country that is 100% wheelchair accessible. I've already published write-ups on the playground on Silicon Valley Mamas, Red Tricycle (the article even got picked up by SF Gate! 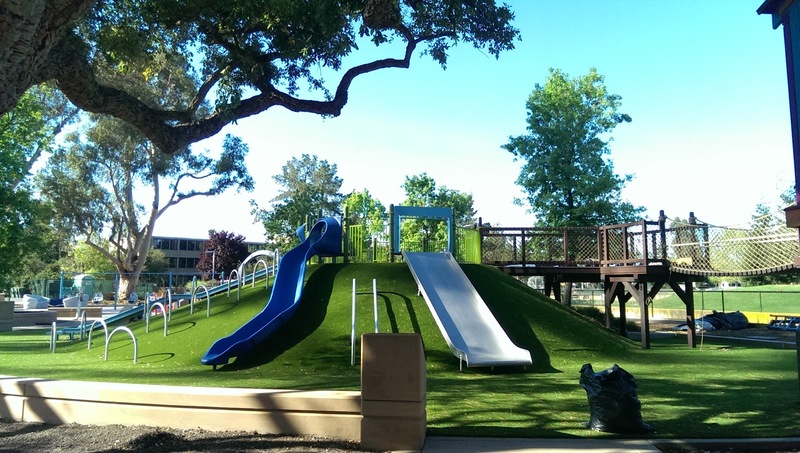 ), and Mommynearest, but I had a few more photos of this wonderful playground that I wanted to share. 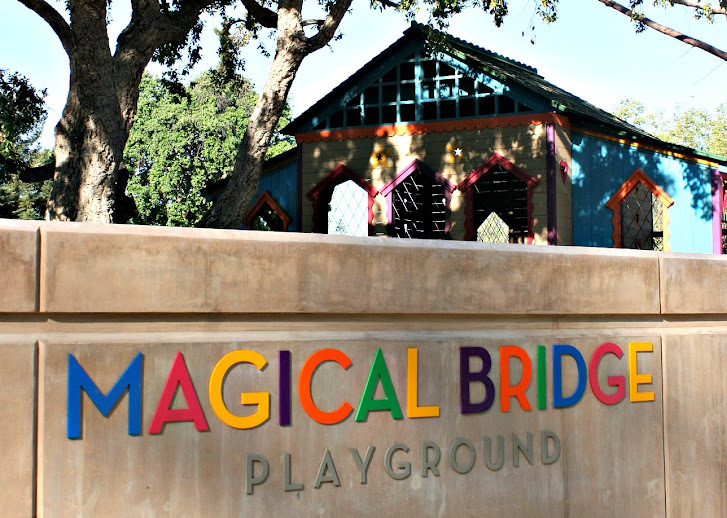 The Magical Bridge Playground is really the result of one person's labor of love. My friend Olenka Villeareal conceived of the idea and nurtured it all the way to what kids are enjoying at this very moment. One of Olenka's daughters has special needs, and Olenka could never find a place for her daughter to play -- so she decided to create her own. Olenka was the driving force behind the concept, fundraising, approval, planning, and construction. 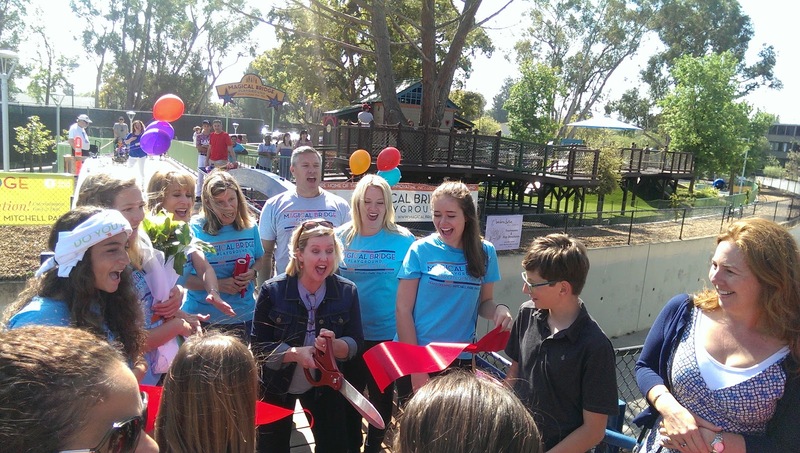 That's Olenka cutting the ribbon at the opening ceremony in April 2015. What an amazing person she is! All the swings are full adult-sized bucket swings with harnesses, so even adults with varying abilities can swing. Swinging, spinning, and swaying are very therapeutic to people with sensory issues, so there are lots of places to swing, spin, and sway, all around the playground. When I said that people in wheelchairs can access any playground feature, I meant it. 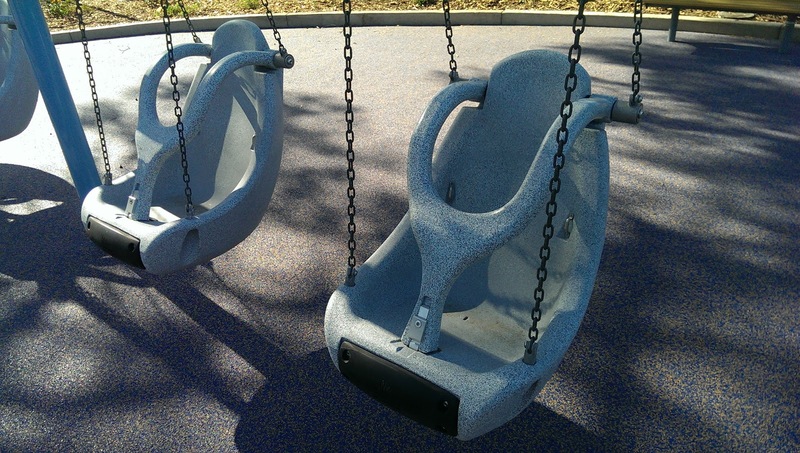 Accessibility isn't limited to the swings. 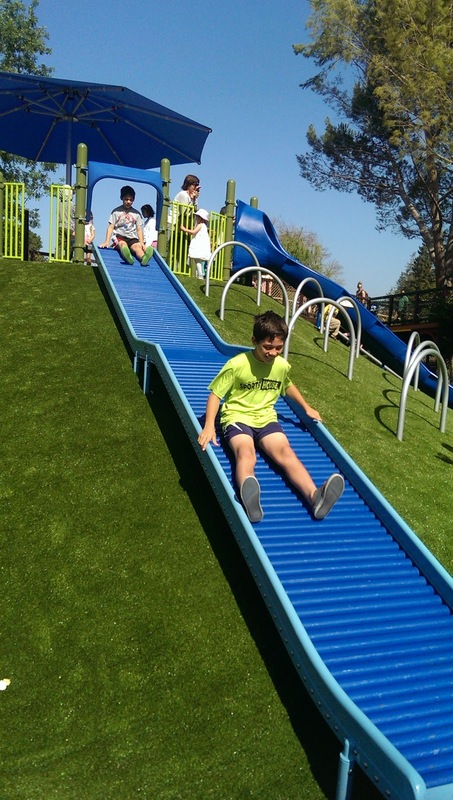 Things you wouldn't think to be wheelchair accessible like the teeter totter, merry-go-round, and spinning rope climbing structure are fully accessible! See that adorable playhouse in the photo? You're actually looking at the second floor of a two-story playhouse! Both floors are wheelchair-accessible, and the second floor actually leads to a swinging rope bridge that's also wheelchair accessible! The first floor opens up to a performing stage where kids can strut their stuff. They're also holding summer concerts on the stage for families to enjoy. The rope bridge leads to a climbing and sliding hill. There are several slides, including one with an extra-wide landing area so that kids who need a little extra time to get back up can scoot over to the side and not get run over by the next eager child on his way down. I love that kids of all abilities can play together at this playground. 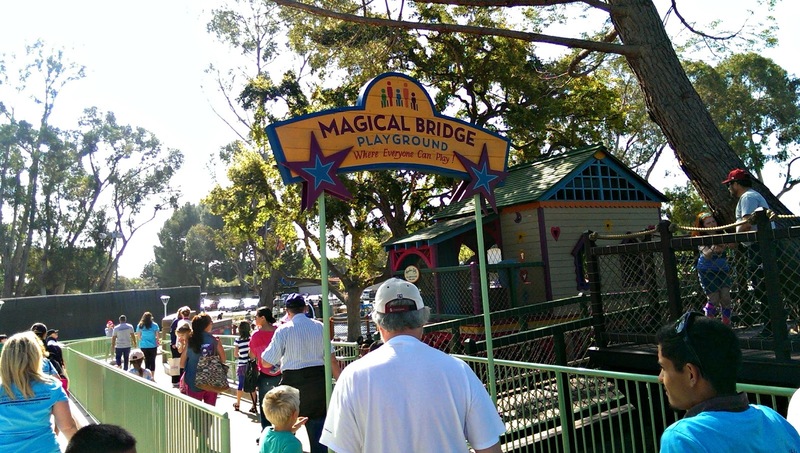 3Po and Jammy had a great time at the opening, and highly recommend the Magical Bridge Playground to any kid! I've always wanted to buy a personalized brick or tile at a place that means something to us (like at our school or at the library or at a playground), so when I heard that the Magical Bridge organizers were selling tiles to raise funds, I jumped at the chance. The photo below does not show the final wall -- you can see a few blank tiles. Good thing too, because our tile isn't there yet! Olenka assures me that our tile will be added to the final version, so I'm looking forward to seeing it! 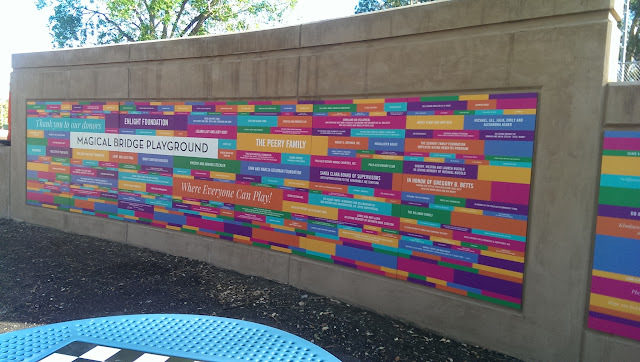 I'm also looking forward to showing the tile to my grandchildren and great-grandchildren :) I can't think of a better playground to add our names to for posterity! Levi's Stadium: The good, the bad, the ugly.